A tropical smoothie franchise presents the opportunity to open your own cafe under a well known brand name. Its well loved menu, large customer base and proven methods help new franchisees achieve profitability in a short time. Furthermore, the company supports franchisees from the start, enabling them meet sales goals. Even school dropouts can easily succeed with the help provided by smoothie franchisors. Of course, their strong success record of existing franchisees proves the worth of this opportunity. To give you a better understanding, this post provides detailed information on opening a Tropical Smoothie Cafe franchise. Founded in 1997, the Tropical Smoothie Cafe is a food business that aims to offer healthy snacking options to calorie conscious populations. By consistently providing tasty, yet nutritious food and beverages, now it has more than 450 franchise operating locations. To keep customers entertained, they have revamped their cafe decor to an exotic tropical theme. Of course, the company pays keen attention towards enhancing customer experience, helping them expand operations successfully. Undoubtedly, buying this franchise will save you the labor of building a brand from scratch. Tropical Smoothie franchises are led by a team of franchise experts that are present and accessible for all of their franchisees. On the Tropical Smoothie website, you can learn all about the team that leads up the franchisee program at the company. Once you read all about their personal business backgrounds, you are sure to be impressed. When you become a franchisee, you have direct access to these team leaders who make it easier for you to succeed in the food service business. Consider this when you are deciding whether or not to open a smoothie franchise with the brand. The Tropical Smoothie Franchise is a unique mix of two businesses, offering both food and smoothies. Unlike other smoothie bars their menu can satisfy customers throughout the day, at all meal hours. Moreover, their friendly and fun ambiance draws customers across various age groups regularly. Quite naturally, Tropical Smoothie Cafe enjoys a higher sales rate than its contemporaries and presents itself as one of the best franchises for women. More importantly, an innovative business mix gives franchisees the competitive advantage to stay ahead of competitors. At the smoothie franchise, their on-staff chefs and nutritionists keep its innovative menu updated regularly. Fresh inclusions and limited time offerings satisfy customers’ taste while driving sales growth. Plus, several meatless options have broadened the customer base, allowing franchisees cater to vegans to. Focusing on innovative menu options, the franchise serves a larger target audience and increases revenue generation. 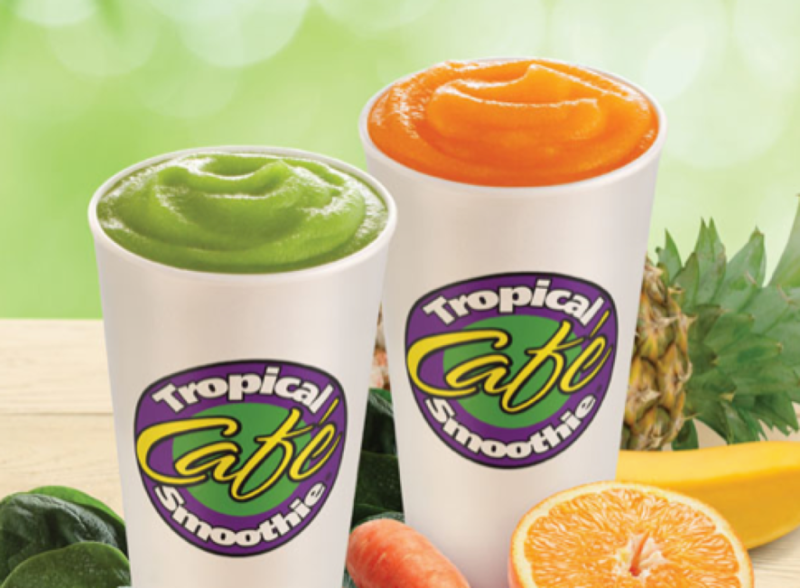 To maintain ease of operations and restaurant sales, Tropical Smoothie Cafe has created a simple franchise business model. Upon getting this franchise, you do not need to purchase costly cooking equipment like bread bakers, fryers or hoods. They provide the necessary tools and equipment needed to succeed. Secondly, the company has franchise development officers to guide franchise owners on how to quickly reach break-even point. Moreover, a wide range of marketing tools promotes franchise locations, attracting a greater number of customers. Definitely, an easy to run business model with timely guidance streamlines operations to deliver better returns on investment. To fully take charge of their new business, every new franchisee gets four weeks of intensive training that covers far more important topics than office partitions or other boring content. The first two weeks of training is offered at a local cafe, acquainting them with business processes. Next, one week is spent in a classroom setting at Atlanta, Georgia to offer insight about best practices. Lastly, on-site training leads to the grand franchise opening. Surely, comprehensive training assists franchisees to run their business confidently. The average estimated cost of opening a Tropical Smoothie Cafe is around $300,000. On top of that, franchisees will be paying 6% ongoing royalty and 2%-3% as marketing charges, depending on gross sales. Eligible candidates should have $100,000 in cash to make the initial investments. Luckily, this franchise arranges loans through third party lenders for appropriate candidates. Certainly, a comparatively low franchise fee and royalty percentage enhances this venture’s profitability and thankfully, no business trips are required. A tropical smoothie franchise is a great business opportunity for both new and experienced business owners. Firstly, its strong reputation gives franchisees instant recognition among target audience. Secondly, a simple business model reduces operating costs and increases profit margin. Finally, financing options and low royalty percentage ensures cost effectiveness. On the whole, Tropical Smoothie Cafe Franchise’s unique business mix allows franchisees earn profit steadily. While Tropical Smoothie is an excellent smoothie franchise option for entrepreneurs, there are plenty of others out there that you may want to consider as well. That is why you should also consider a Planet Smoothie franchise. Planet Smoothie franchises have been growing rapidly recently thanks to their new management, Kahala Brands. This is the company responsible for launching successful franchises like Cold Stone Creamery and Blimpie. If you want a low-investment food franchise, so you do not have to worry about cost containment strategies, consider Tropical Smoothie franchises.